Photos and report from the February 2012 Brewtopia Euro beer tour through Netherlands, Belgium and western Germany. pork knuckle lunch at Uerige in Dusseldorf. Ignore Owen when he says "2011" - it was 2012. This epic beer excursion took our group of people from Brewtopia.info, TheBeerWench.com, Terrapin Beer Company, Taco Mac, Five Points Bottle Shop and Highland Beverage through seven days of beer across the Netherlands, Belgium and western Germany. This webpage chronicles the journey. Our first beers of the trip at De Prael brewpub in the heart of Amsterdam. 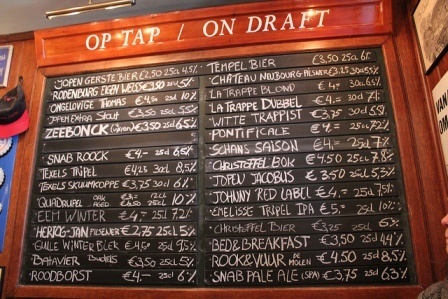 The impressive Dutch beer list at Cafe 't Arendsnet in Amsterdam. So many rare craft beers from the Netherlands! We did a five year vertical tasting of barrel aged La Trappe Quadrupel at Arendsnest. Dan got a little crazy at De Bierkoning (the best craft beer store in Amsterdam). If we had a magic spell to instantly transport cases of beer home, each of us would have spent hundreds of dollars at Bierkoning. Peter van der Arend's Beer Temple is an amazing tribute to American craft beer in Amsterdam. Peter van der Arend (in pink & grey stripes), owner of Amsterdam's Arendsnest and Beer Temple, has done a tremendous job in bringing craft beer to the city. The impressive exterior of the La Trappe brewery near Tilburg, just a few miles south of Amsterdam. Our group received a VIP tour through the beautiful La Trappe facility. La Trappe is proud to be the only Trappist brewery in the Netherlands. La Trappe's barrel aging program produces some very complex and flavorful ales. Lunch at the La Trappe visitor's center. No beer visit to Amsterdam would be complete without beer and cheese at the famous Brouwerij 't IJ - just a few blocks walk from the center of town. Alex and Jessica pose in front of the gleaming brew kettles at Amsterdam's Suster brewpub. Brewer and board member of Suster brewpub discuss the next seasonal brew. ON TO GENT! 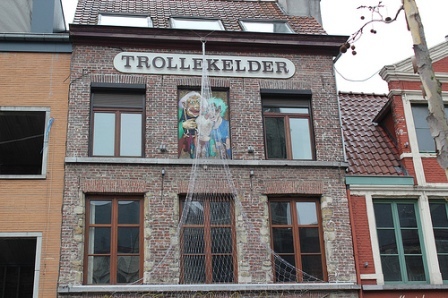 The Trollekelder pub in Gent provides several floors of atmospheric, troll-themed rooms in which to enjoy classic Belgian ales. De Dulle Griet pub offers probably the best beer selection in Gent. Dan and Lee admire the atmosphere of the back room at De Dulle Griet. It's funny how moods improve after a few great Belgian beers. Sachin, Jim, Spike, Lee, Kerri and Brent raise a toast. Gent's most unusual pub is most definitely Velootje. So crammed full of furniture and memorabilia, Velootje barely had room for Brent to sit. Here is the slightly bleary eyed group ready for the morning tour of Rodenbach in Roselare, Belgium. Rudi Ghequire, brewmaster for Rodenbach, pours an aged sample from a beautiful, wooden storage tank in the brewery cellar. Rudi is a master at blending aged and new Rodenbach to achieve a perfect sour balance. Pure aged Rodenbach is known as Gran Cru. Rodenbach's visitor's center offers group meals and tastings. Belgian beer is all about pairing with foods. Here is our herbal, yet sweet, ice cream that paired well with Rodenbach. Bruno is the co-owner (and husband of the brewer) at the tiny, artisanal brewery 't Gaverhopke in Belgium. Bruno was nice enough to show us around and provide some tastes. 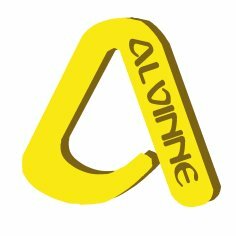 The guys at Alvinne Brewery do a wonderful job in producing a wide range of flavorful and interesting Belgian craft beers. Gent's only city brewer is a woman. Annick de Splenter produces a lineup of five or so delightful herb beers at the Gruut brewpub. Owen's favorite spot in Brussels is the authentic Cantillon Brewery Museum - home of historic sour lambics. Cantillon's brewer tells the group about a couple of experiments he's doing with aging lambic in wine vessels. Owen pours the group a couple of very rare bottles of Cantillon Zwanze. Cantillon workers gather hops for the day's brew. Cantillon's gift shop manager did now know what hit her after our group departed. L-R: Russ, Brian, Sachin, Spike, Charlie, Lee, Fred Jessica and Alex prepare for an amazing beer pairing lunch at our favorite Belgian beer restaurant - Heeren van Liedekercke near Brussels. We did some damage to the vintage beer menu at Heeren van Liedekercke. Dan's lambic from the '80s even had a petrified spider on it! KOLSH in KOLN! Here is the barrel filling room behind the restaurant of Koln's Päffgen brewery. 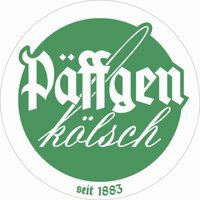 In one day, we visited the very best Kolsch houses in Cologne - Päffgen, Früh am Dom, Sion, Peters, Gaffel, Pfaffen, Sünner, Malzmühle and Reissdorf. We arrive at Malzmühle Kolsch tavern near the end of our day in Koln. A DAY in DUSSELDORF: The Uerige brewmaster starts our tour with a visit to the impressive copper koelschip (cool ship) that begins the cooling process for the wort. Uerige produces the most hoppy and flavorful Altbier in Dusseldorf. Gigantic bales of whole-leaf Hallertau hops fill the hop cool room at Uerige. Charlie and Lee pose among Uerige's characteristic red and black serving barrels. After the tour, Uerige served us about 100 glasses of Alt alongside a massive pork knuckle. Above: Jim, Kerri, Owen, Russ and Hamp. Here are Charlie, Brian, Jessica, Dan, Sachin and Lee sampling the excellent Altbier at Brauerei Schumacher in Düsseldorf. Brauerei Kürzer, Dusseldorf's newest Altbier brewery, is located in a small brewpub setting. On the day of our visit, we found their Alt needed a bit of work. We hope they keep improving. 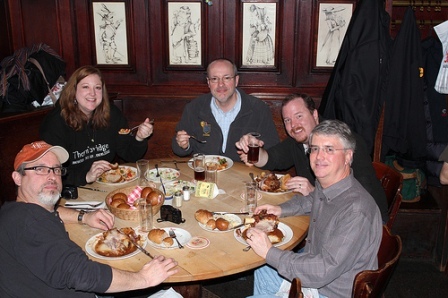 Our final Altbier and meal of the trip took place at the old Frankenheim tavern in Dusseldorf. Earlier in the day we also sampled Alts from Füchschen, Schlussel and Schiffchen. Dan was also quite fond of the Schlösser altbier at the pub across from our hotel. Another enjoyable trip exploring traditional beers and beer culture of Europe! Next year it's back to the UK!